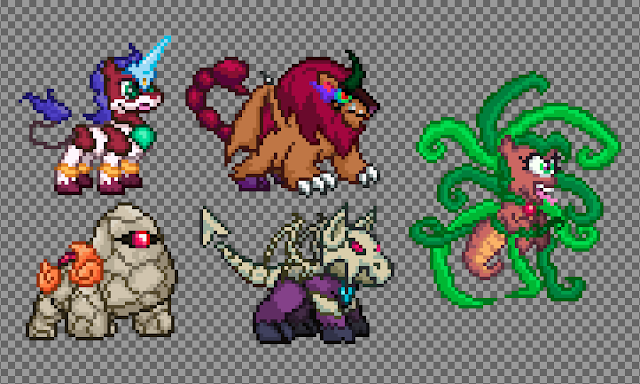 Some of the bigger battle sprites. 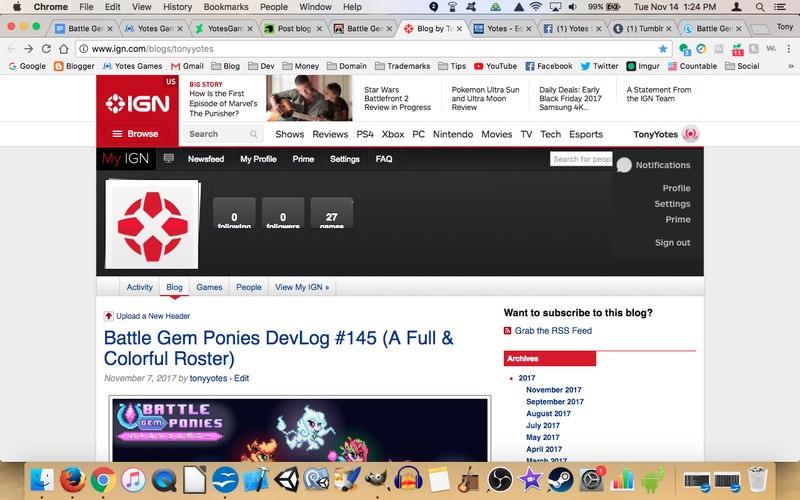 The Ponatina post last week made a lot of impressions and it's refreshing to see so many pony fans excited for this game. It's lit a fire under the Yotes Games balloon and now we're soaring straight to our destination! Every pony has a second draft design and is now in the final nebulous zone of "what color combination looks best" or "maybe this should be the Ultra form and the base form should be toned down a little". It annoys me as a developer because it's taking so long, but this is arguably the most important part. 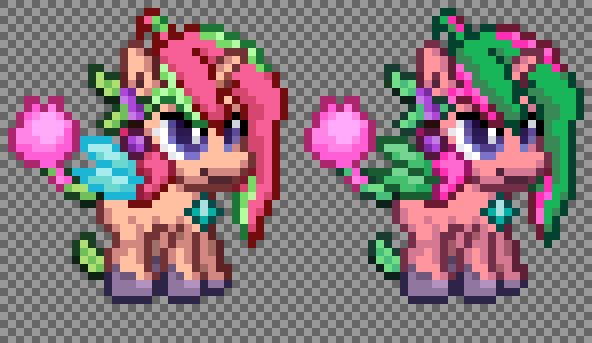 These ponies are what players will attach themselves to. If they look awesome enough, and have enough personality, it'll spawn fan art, discussion, attention, and thus sales. All very important if I want Yotes Games to be a viable career choice. 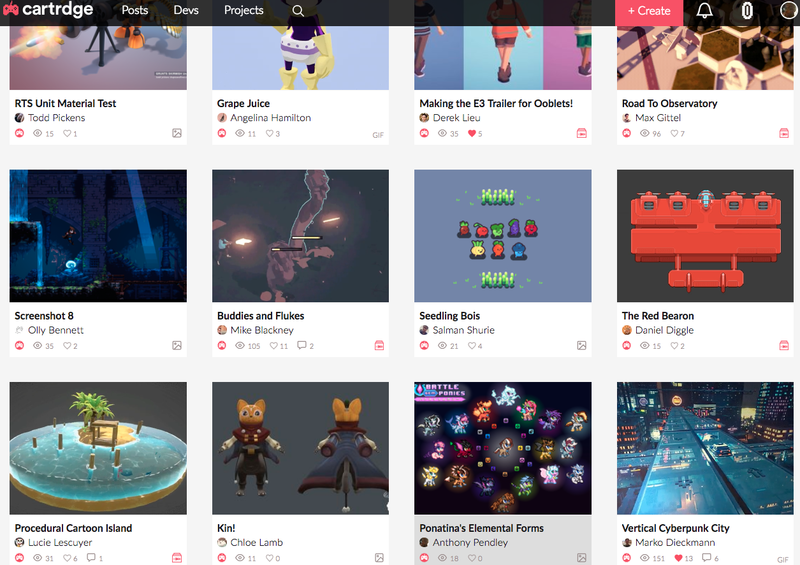 Get the rest of this week in gamedev below. Making this header image last week was a good call. Gained a lot of interest for the BGP project. so I'm guessing after years of staying quiet and becoming less active, it finally died. Making Promo Images like the Ponatina one is essential for creating hype. January and February will need to be filled with cool screenshots and pictures like that catch people's eyes and encourage individuals to share. Commenting is important. By responding to everyone who reaches out to me, I make them feel more connected to the project itself. These will become the game's champion users who go on to leave positive reviews and actively share the game with their friends & communities because the game's creator is a friendly member of the community. YouTubers & journalists will make content for things that are already popular and make them even more popular. The secret to making this game a big deal is to have it already look like a big deal when I pitch it to the big names. People love seeing the game's characters, so why not show them off more often? Give each one a spotlight and explain who they are and how I came up with em? 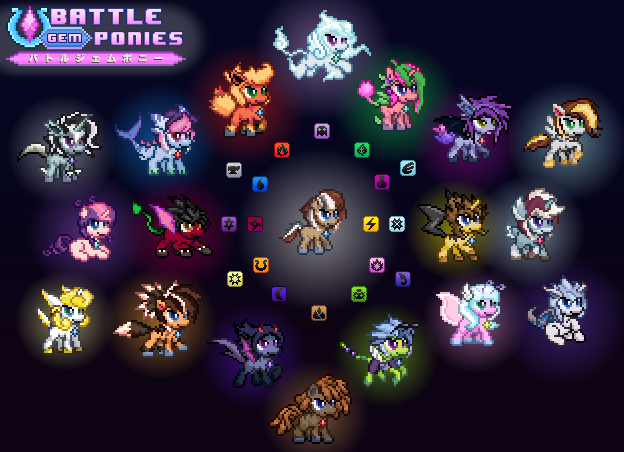 That's why in the weeks leading up to launch I'll be making Roster Posts like I did before but this time with all the ponies & their Ultras in much greater detail. Maybe even sharing one a day starting with a massive post about all of Ponatina's forms. High chance this is my most popular post on Facebook. The Ponatina header from last week caught on. 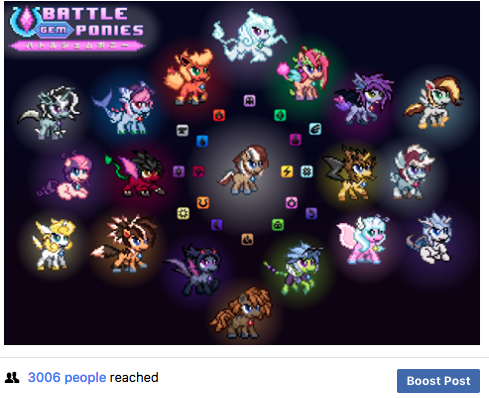 It got thousands of views on Facebook and lots of likes and comments on Twitter, EQD, Discord, some forums here and there, and in various brony facebook groups. 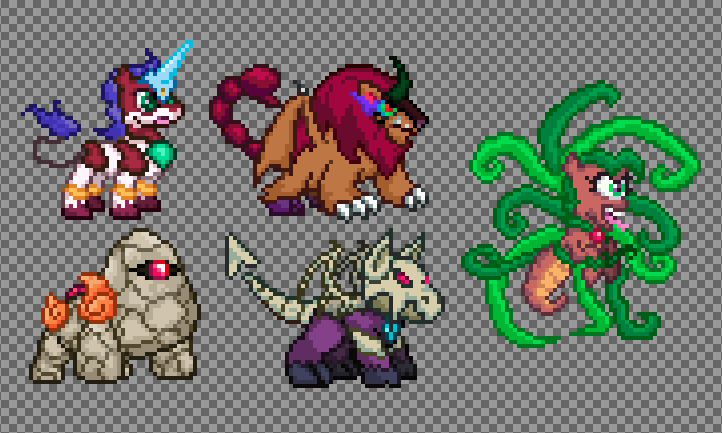 I want to keep that momentum going, so I'll be sharing new sprites every week to keep at least some of those people coming back on a regular basis. 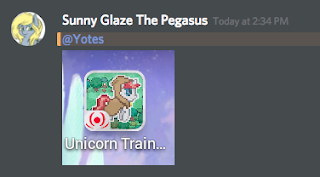 I get giddy whenever I see people enjoying my old games. There's over 140,000 people out there who actually know about this pony game I made. A big thing to go on now is releasing some nice fancy artwork when the alpha demo comes out. I want thousands of people downloading that demo at once so it'll already be decently popular when I offer the game to YouTubers. 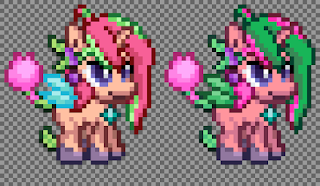 And don't forget, each pony is getting a Chroma version with alternate colorations. Drawing all these ponies is a big. time-consuming effort, but I hope it pays off in spades with marketing. These ponies need to inspire people to care and take this game seriously enough to not mark it off as "just another mobile game" or a "pokemon ripoff". I want people saying things like "wow", "cool", "what's this", and "one guy made this?" when they see anything from it for the first time. First impressions are everything, and Ponatina has shown me I'm on the right track.